Grilling lobster tails seems intimidating at first. But it doesn't have to be. Part of the fear is the expense of the meat itself, and if you mess it up, well, that's depressing. But, if you follow these pointers and view the video, you will do just fine, I promise. You will be grilling lobster tails like a professional. I grilled these lobster tails on my propane gas grill, but charcoal works just as well, if not better. Buy good lobster meat: I know this sounds simple, but the lobster tails shouldn't have a ridiculously strong fish odor. Work with a meat / seafood shop you trust. Make sure your grill is really clean: Get the grill smoking hot, then brush it down with a wire brush. Make a great butter sauce for dipping: No worries, a great recipe is further down the page. Never leave the grill: These lobster tails will cook quickly, and it's a fine line between great lobster and a piece of rubber. When you take it off the grill, serve it IMMEDIATELY: Lobster tails get cold really quickly, and you don't want to warm them up. It's a bit of a stretch to call this a "recipe, but this simple butter mixture is absolutely perfect for the grilled lobster tails. This was for two tails, each split in half. Simply mix it all together and set aside. Spread on top of the grilled lobster tails. Again, not much to report here. 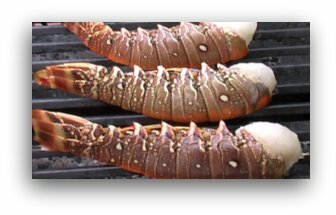 Rub olive oil on the meat of the raw lobster tails, and place meat-side-down on a grill that is at medium heat. Allow to cook for 2 to 3 minutes, then turn the lobster tails so the are meat side up. Allow to cook for 5 to 6 minutes. You should notice the meat swell up a bit. Take it in, apply the butter immediately and enjoy! Want to ask Dave a question, click here. He should get back to you within 24 hours, maybe sooner. Don't forget to sign up for Dave's email newsletter. Just enter your info below. Click here to leave Grilling Lobster Tails and return to the homepage.